Brisbane is the capital city of the state of Queensland, situated on the Brisbane River on the south-east coast of the state. Brisbane City Council covers the whole of the metropolitan area, unlike, for example, the case of Sydney City Council, which only occupies the CBD and adjoining suburbs. The flag of the City of Brisbane features six quarters, ('segments' according to a brochure from the Brisbane City Council) in two rows of three, all surrounded by a border of blue and gold, the city's colours. The upper hoist segment contains a gold caduceus (a herald's wand with two serpents twined around it) superimposed over white wavy lines on a blue background. The next segment contains a Stafford knot, a white star and a Stafford knot vertically on a blue background. The remaining segments alternate between these two designs. The flag of Brisbane is based on the armorial bearings and coat of arms of the city: Blue and gold are the colours of Brisbane. Blue for the sea (Brisbane is on the eastern coast of Australia) and also for the river on which Brisbane is situated. Gold for the sunshine -- Brisbane is the capital city of Queensland which is nicknamed "the sunshine state". The blue and white (silver) wavy lines represent the river again. The gold caduceus (a herald's wand with two serpents twined around it), although better known as the symbol of medicine, in this case represents commerce and peace and is the emblem of Hermes (Mercury) in his capacity as protector of commerce. This is emblematical of the everyday activities of the city and likewise appropriate for a city with status. Taken together, these symbolise Brisbane as a commercial river port. The blue field, white stars and gold knots all refer to attributes of Sir Thomas Brisbane after whom the city is named. Sir Thomas Brisbane was a governor of the Moreton Bay convict colony in the convict days of Australia. Later Moreton Bay colony was renamed Brisbane is his honor. The blue field and white stars (mullets) represent Sir Thomas's interest and achievements in the field of astronomy. The gold knots are Stafford knots. The Stafford knot is the badge of the 38th Foot Staffordshire Regiment in which Sir Thomas first entered the British Army as an ensign in 1789. He had a highly distinguished military career serving under the Duke of Wellington in the Peninsular War where he fought with distinction, reaching the rank of general. The shield symbolizes the total activities of the city and the personage of Sir Thomas Brisbane from whom the city takes its name. The blue in the chief represents the heavens and the parting line nebuly the clouds. Sir Thomas' achievements in the field of astronomy are indicated by the two mullets. The Stafford knot is the badge of the 38th Foot (Staffordshire Regiment) in which Sir Thomas Brisbane first entered the British Army as an Ensign in 1789. The Caduceus is the symbol of Commerce and Peace, and is the emblem depicted for Hermes in his capacity as God and Protector of Commerce. 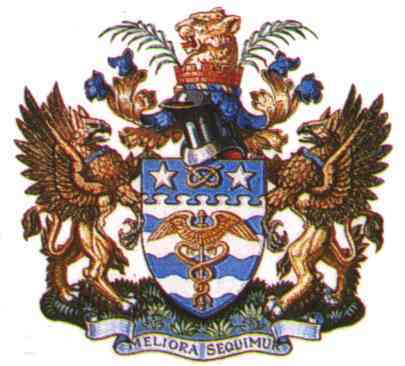 Two Gryphons support the design, together with the motto "Meliora Sequimur". The Gryphon is one of the principal bearings in heraldry, and frequently is used as a charge or supporter. The chimerical creature is half eagle and half lion and it is said that when it attains full growth, it will never be taken alive. It is spirited, animated, fantastic and vivacious. The wavy blue bar around the neck refers to the city as a port on the river. The palm leaves in the crest are a symbol of victory included as a compliment from the Council to the valour of Australian Fighting Services. Bold courage, patience and high-mettled attributes are conveyed by the leopard in the crest. The colours of the city, blue and gold, are indicated by the wreath at top. Interestingly, the flag is not a banner of arms, as the Coat of Arms does not have 6 quarters, but rather a blue chief nebuly, as described in the text, bearing not two knots and a mullet, but two mullets and a knot. The rest of the shield is the cadeceus superimposed on the blue/white wavy bars.